A professional web designer has the skills required to create an engaging, visually appealing website. Decisions about color schemes, typography, and visual hierarchy will be carefully considered by a professional web designer. A pro will create a unique, memorable, trustworthy website that builds business. First impressions matter. It’s challenging to fully comprehend how rapidly the web is changing. 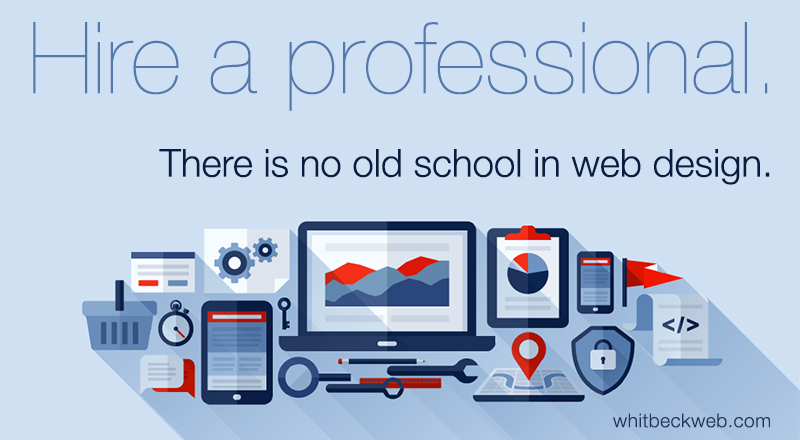 Professional web designers keep abreast of current technologies and trends. Hire a pro and you’ll have a website that’s state-of-the-art, looks good on all browsers, and is thoughtfully structured for ease of navigation. Your business website should be responsive and mobile ready. Functionality matters. Business websites need user-friendly designs and industry specific customizations. In today’s busy world, website visitors want to access information easily. If site visitors can’t find what they want quickly, they will abandon your website. Ease of use matters. After a consultation, a professional web designer will provide a skilled analysis of your business and branding. A professional will provide a fresh perspective on your business, take a customized approach, and develop targeted, industry specific website. Marketing matters. Yes, you could try to create your online presence using a proprietary website builder with a template. However, you’ll end up with a website based on a much used theme without any unique qualities. You could also hire your nephew’s best friend, but you’ll likely end up with a dull design and limited functionality. Also, technology changes quickly. When your business is at at stake, tech support is essential. A small web design business has the flexibility to scale your website project to suit your needs. They are more apt to provide personalized attention and produce a website that accurately reflects your business. Hire a professional web designer. You have a business to run. You don’t have time to spend figuring out how to design and build an effective website for your business. Time is money. In the long run, hiring a professional web designer is a wise financial decision. Use your time productively on sales and customer relations. The professional web designer will build a website you can be proud of, one that will build your business.